My Thursday Line Ups were close, but just one pay out……. 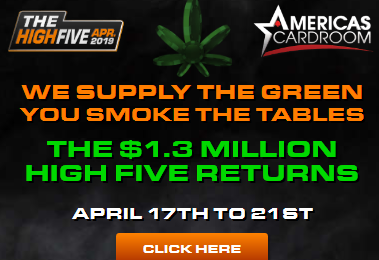 I was only 6 points off a small pay out on both the $250K and $100K Tourneys……. The night started slow scoring for my line up and I started creeping up the rankings when the late games started. If only OKC and GSW would have gone into OT or if I had started K Durant 54.5 pts. instead of B Westbrook 39.7 pts. (their salaries were about the same) I would have ranked a little higher. The late night contests also were slow starting for me, but at about 11:30PM I finally hit a payout and once again an OT game by OKC/GSW would have been to my benefit. Most late games that go into OT usually screw me, but last night it would have been nice, I was heavy into the last game with players. 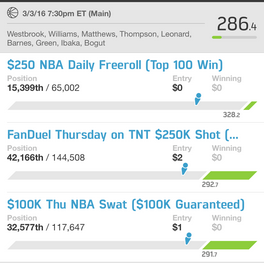 The $2 – NBA TNT $250K had 3 players tie for 1st with 350.1 points and they each won $13K. 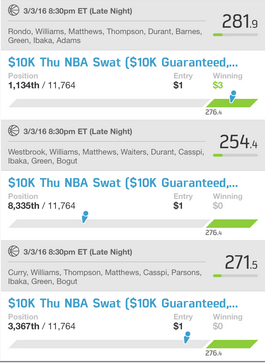 The $1 – NBA Swat $10K winner had 312.9 points for a $750 win. There are 10 games on the Fan Duel NBA Slate tonight and player salaries are not as top heavy as last night on all the slates. I got my monthly FDP Bronze free roll invite last night, that’s a $2000 Rewards Free Roll for low limit players like me. Watch the status of Clarkson on the Lakers, if he plays you might want to switch out G Harris DEN with him, you’ll have enough salary to do it.